I am a HUGE fan of the original Jumanji movie, so I will have to watch this one. It won’t be the same, but I love Dwayne Johnson, so I know it’ll be a good one to see! I loved following along with this trip for the activities and interviews you did. I can’t decide how I feel about this movie… On the one hand, I’m kind of sad they remade such a classic Robin Williams staple from my childhood… but on the other it looks kind of fun. I know we’ll be seeing it, the kids already let us know they want to go. That’s so amazing! I’m glad you got to go. How fun. My sister is taking my boys and their cousins to see this movie shortly after Christmas. It’s their Christmas present. This looks like such a fun movie! I can’t wait to go see it. OH WOW! It’s really awesome that you had the chance to meet them and interview them as well! I’m sure it was an amazing experience! I didn’t realize they were making a new movie! I remember watching this as a child! I’ll have to check this new one out! I am a fan of Dwayne Johnson because he is a very versatile actor. I would love to watch this new Jumanji movie. It would be another worthwhile film. I would also get a copy of the DVD once its out. How cool you got to interview the cast! I saw the trailer for this a few weeks ago and I almost peed laughing! I’m so excited to see some of my favorite actors all together in one movie! A great interview.. I can’t wait to see this movie! I love Dwayne Johnson,.. he is so talented! I have been looking forward to seeing this movie. Dwayne Johnson and Jack Black are two of my favorite actors. I like that there is more meaning behind the movie. This is such a great cast of actors. Oh my word. I would die a little bit! I absolutely adore Karen Gillan. She is all kinds of fabulous. I want to see this so bad. It looks so cool and I love the actors they chose! Great interviews and the movie I am sure will be good. Jumanji was always a hit, so this one has to be just as good. This movie looks really fun – and it looks like you had a great time with the interviews! It’s a great ensemble cast. What an awesome interview, I loved the first film and at first I was worried they were making another but it really sounds absolutely fantastic I am looking forward to getting to see it. I’ve heard such great things about this movie! Looks so fun! Can’t believe it’s been so long since the original came out. I can’t wait to see this movie. I loved the original Jumanji movie so I’m excited to see this one with my family. My kids and I are soooo excited for this movie! What an awesome group of people you got to interview! Jack Black + Dwayne Johnson AND Kevin Hart? Amazing! That sounds like it was such an awesome press trip! I would love to meet Dwayne Johnson in person someday! 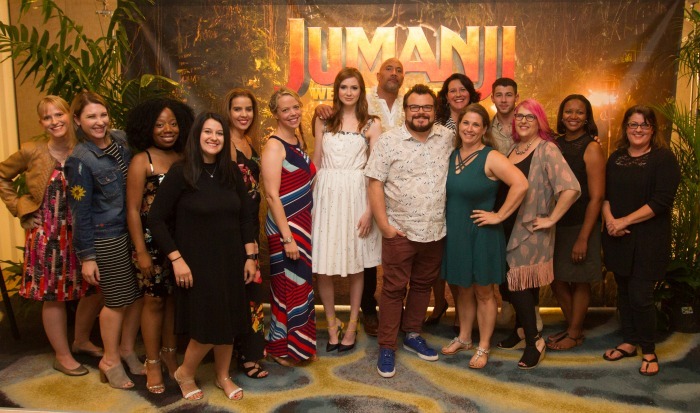 We can’t wait to see Jumanji in the theater! Love the original Jumanji so much! I really want to see this one. This is one that reminds me of my childhood. What an amazing group of people. This movie is going to be an instant classic. It sure sounds like a great time was had by all. Jumanji sounds like it would be a fun movie to see. What an awesome opportunity Liz! I am SO excited to see this film. We’ve watched the original so many times our kids and grandkids can recite the whole thing. I can’t wait to see this movie. I have always loved the Jumanji franchise but couldn’t imagine anyone could step into Robin Williams shoes. I think they made some great casting choices and it’s going to be really fun. All of the cast does seem like really lovely people in real life. I am sure they all had such wonderful chemistry on the set. I am taking my daughter to see this on her birthday next week. We can’t wait! Isn’t it exciting! I really cannot wait for this movie and the kids are also looking forward to it! The cast is really awesome, love the actors that they picked for the roles! So fun! We’ll be seeing this movie for sure. The previews alone make us giggle. Plus Kevin Hart is hilarious. What an incredible event and interview! We cannot wait to see the movie! This looks like a really fun movie, and I enjoyed reading about your great experience meeting these actors! The movie looks so great and the experience you had is priceless. Also, is this the press trip to HAWAII?!!! I am so jealous! I cannot wait to see this movie! I am so jealous you got to go to this! I love the cast variety, and I think the movie will definitely be hilarious because of it! I heart Jack Black so much! I am excited to see this film. We loved the original – great story. Seems like a bunch of good ones coming out this week. Between this, Downsized and Pitch Perfect, I’ll be getting my fill of popcorn! My family can’t wait to see this movie!!! What a fun interview to get to do, I love they remade it! The kids have been bugging me about going to see Jumanji! We watched the original one, but they’re more into Duwayne Johnson and Kevin Hart. Your interviews were awesome! I actually really want to see this! It looks so much better than the first one! I’ve heard this movie’s plot is more based on today, with video games. I think that’s pretty cool! Loved your interviews! My kids have never seen Jumanji! I would love for them to possibly watch this one to get them started! Love this interview and I can’t wait to go see the movie. I’m so happy they were all nice, especially Dwane because I too would think he would be awesome in person and glad my bubble didn’t burst. I really want to see this movie! And OMG….and interview with Dwayne Johnson! How lucky. I try to see every movie that he is in an used to watch WWF wrestling, when he wrestled. We saw the original movie and are looking forward to seeing the new one that is coming out. Great to learn more about the cast . I have seen commercials for this and totally can’t wait to check it out. Brings back childhood memories that’s for sure. I want to see this movie! It looks like it is REALLY funny and I love movies that are just fun to watch! This had to have been such a great opportunity for you! I would have loved to interview them! I love Jack Black and I try to see every movie he’s starring in. This is a great family movie to watch over the holidays. Dwayne ‘The Rock’ Johnson and Kevin Hart are super funny. I love the plot of this remake. Your interviews with the actors were really awesome! Dwayne ‘The Rock’ Johnson and Kevin Hart have a real good chemistry. It’s not a surprise they’re a hit in this movie. I love the plot. Your interviews were really awesome!